When listing the individual elements under each category, careful thought should be given to the importance of each item. A laundry list of 7-10 factors for each category is fine in the first draft. However, only the elements with significant impact on the business should be recorded in the final analysis (approximately 3-5). 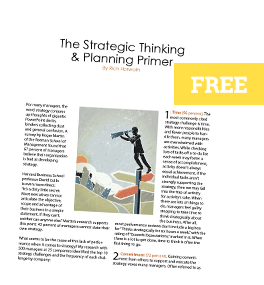 Marshaling the mental discipline to create a tight SWOT analysis enables you to move into planning mode with greater clarity and focus—two keys to strong strategy. There is a fine line between the factors in the SWOT analysis being brief and being meaningless. How many times have you seen a SWOT analysis with “quality” listed under the strengths or weaknesses column? That’s about as useful as putting down the word “the.” The factors listed need to be specific enough so that someone reading the analysis without the creator sitting next to them can understand to a reasonable degree what is meant by the factor. Recording “manufacturing line breakdowns” rather than “quality” as a weakness is much more helpful because it alerts the reader to the specific cause of the issue. Another common mistake is listing the effect rather than the cause of a strength or weakness. An example of a strength often listed is “#1 market share.” What would be much more helpful is to list the cause of that #1 market share—i.e., consultative selling skills of sales reps, 3:1 advertising spend ratio versus the competition, etc. Listing the cause also plays another important role by allowing managers to more easily identify and share best practices among the group. Knowing what’s driving market share leadership can be usefully applied to other groups within the organization. Despite the clearly defined lines of strengths/weaknesses being internal and controllable and opportunities/threats being external and influenced, factors are often mistakenly placed in the model. The rule of thumb is if you can allocate your resources to a factor and control it, it is a strength/weakness. If your resource allocation can influence but not necessarily control the factor, it is an opportunity/threat. Think way back to those lectures on Einstein’s theories of general and special relativity (as painful as that might be). In modern physics, the mass of an object is a relative quantity. In the world of SWOT analysis, the size of opportunities and threats are relative quantities as well. Managers of two different brands both might list the opportunity of “large Medicare population” for their biotech product. However, “large” for one manager might mean a $2 million opportunity while “large” for the other manager might mean a $20 million opportunity. If we haven’t quantified the opportunity in the SWOT analysis then how will we know? More importantly, how will any of the other key players in the organization know? Quantifying opportunities and threats allows you to more confidently allocate your limited resources to those that will provide the greatest return on investment. Sometimes we don’t have all of the necessary data to make an exact quantification of the opportunity/threat. That’s when your expertise comes into play so go ahead and ballpark it—give a rough percentage or ratio (i.e., competitor ad spending is 2:1 in this market segment). What other traps or pitfalls have you seen in doing SWOT Analysis? Would enjoy hearing about them.